NASSAU, Bahamas Hurricane Sandy lashed the central Bahamas on Thursday night with violent winds and torrential rains, after raging through the Caribbean where it caused at least 21 deaths and forced postponement of a hearing at the Guantanamo naval base on Cuba. Meanwhile, forecasters warned that Sandy will likely blend with a winter storm to cause a super storm in the eastern U.S. next week whose effects will be felt along the entire Atlantic Coast from Florida to Maine and inland to Ohio. Some weakening in Sandy was forecast during the next 48 hours, but it was expected to remain a hurricane for a couple of days. By Thursday evening, the hurricane's center was about 105 miles east of the Bahamas capital of Nassau as it spun between Cat Island and Eleuthera in the central Bahamas. The storm had maximum sustained winds of 100 mph , down slightly from earlier in the day, and was moving north-northwest at 17 mph. Caroline Turnquest, head of the Red Cross in the Bahamas archipelago off Florida's east coast, said 20 shelters were opened on the main island of New Providence. He said his biggest concern is that a boat filled with basic supplies for the island canceled its trip until next week. On Ragged Island in the southern Bahamas, the lone school was flooded, "we have holes in roofs, lost shingles and power lines are down," said Charlene Bain, local Red Cross president. "But nobody lost a life, that's the important thing." "We're talking about a confluence of events," David Bernard, chief meteorologist for CBS News' Miami station CBS 4 said. "We have a powerful hurricane ... in the Bahamas. That's a lot of warm air, a lot of heat, a lot of energy and of course we're deep into fall now and we have an unusually strong jet stream dip with winter-like cold air, and you put those two things together, that's the possibility that is on the weather maps right now and that could lead to a powerhouse low pressure forming Sunday and Monday. "So you would have storm-force winds, coastal flooding, very heavy inland snows could be possible through parts of Appalachians into western Pennsylvania and with that heavy snow and strong winds at the coast we could be looking at significant power outages as well. So it's kind of the worst of everything coming together, winter and what the tropical season has to offer. There is still the possibility this low stays out to sea, but right now we're thinking there's a pretty good chance there could be some impact." In Cuba, authorities said the dead included a 4-month-old boy who was crushed when his home collapsed and an 84-year-old man in Santiago province. 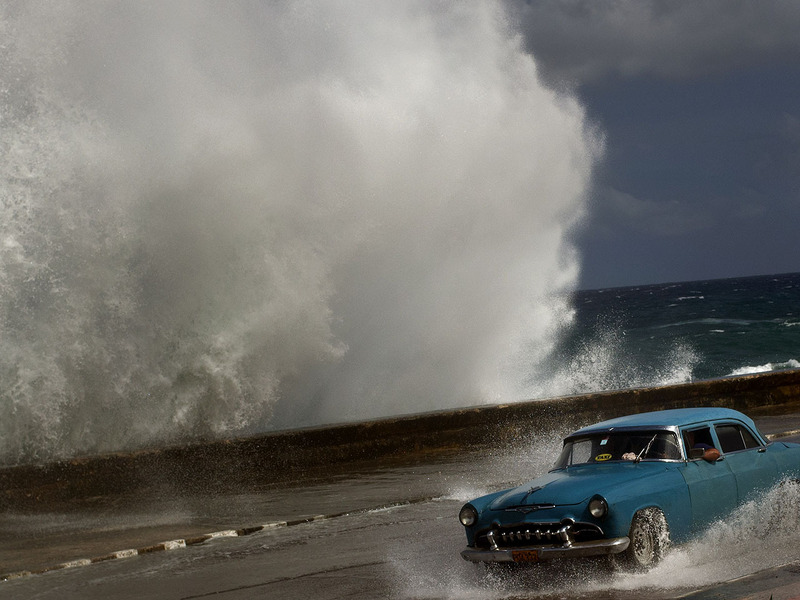 Santiago, Cuba's second largest city near the eastern tip of the island, was spared the worst of the storm, which also slammed the provinces of Granma, Holguin and Las Tunas. In Haiti, Joseph Edgard Celestin, a spokesman for the civil protection office, said the country's death toll stood at nine, including three people who died while trying to cross storm-swollen rivers in southwestern Haiti. He did not provide specifics of how other people died. Far out in the Atlantic, post-tropical cyclone Tony kept weakening and posed no threat to land. The storm had maximum sustained winds of about 40 mph and was moving east-northeast at 22 mph. It was about 615 miles southwest of the Azores.